Many people are excited that the ESV study bible has been released. I certainly hope I’ll be getting it as a gift for Christmas as by all accounts it is a very high quality study bible. If you still aren’t sure if you want to buy it (even after reading a few of the free extracts) the ESV team are also allowing you to access to Matthew Chapter 1 free online. 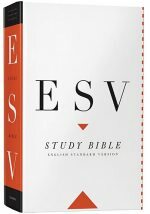 If you purchase the ESV study bible you can have access to the whole study bible online “free”. The ESV blog has a summary of the online features. Alternatively, you may want to read the comprehensive review of the ESV study bible written by Tim Challies. Pingback: iPhone Gala » Free guide to the people in Acts… and more!